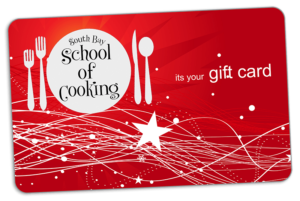 If you want to share the joy of cooking with a friend, South Bay School of Cooking Gift Cards may be purchased through our online system. Please consider that most classes cost approximately $80. You may request Gift Cards to be sent to you or directly to a gift recipient via email. You may also order Gift Cards to be shipped via regular U.S. Mail. Sorry, we are not able to accommodate “walk-in” purchases.